Add Zebra CHEER bling to any ACD Sports cheer top, cute rhinestone & stud design comes with black, crystal, fuchsia or red outline. Minimum order 8. Add Zebra DANCE bling to any ACD Sports cheer top, cute rhinestone & stud design comes with black or fuchsia outline. Minimum order 8. Add Zebra Peace Sign bling to any ACD Sports cheer top, cute rhinestone & stud design. Minimum order 8. 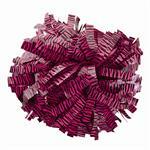 Big Double Layer Zebra Print Bows with Sequin Ribbons in 6 colors, minimum order 6 bows. Zebra Stripe Anklet Socks by Pizzazz #7090-AP in XS-S-M-L in several colors. Minimum order 12 pairs. 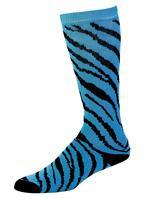 Zebra Stripe Knee High Socks by Pizzazz #8090-AP in XS-S-M-L in several colors. Minimum order 12 pairs. Zebra Print Travel Bag with Megaphone pocket & iPod pocket available in 5 colors. Minimum order 3 bags. Zebra Print Multi-Sport Travel Bag with iPod pocket available in 5 colors. Minimum order 3 bags. Zebra Print Bows in several great color combos, including a rainbow zebra & cheetah bows. Minimum order 6 bows. Zebra Print Small Duffel Bag available in 5 colors, minimum order 4 bags. Animal print boys cut briefs in Zebra, Hot Pink Zebra, Tiger & Leopard, youth & adult. Minimum order 6 pairs. Animal print cheer briefs in zebra, hot pink zebra, tiger & leopard prints, youth & adult. Minimum order 6 pairs.